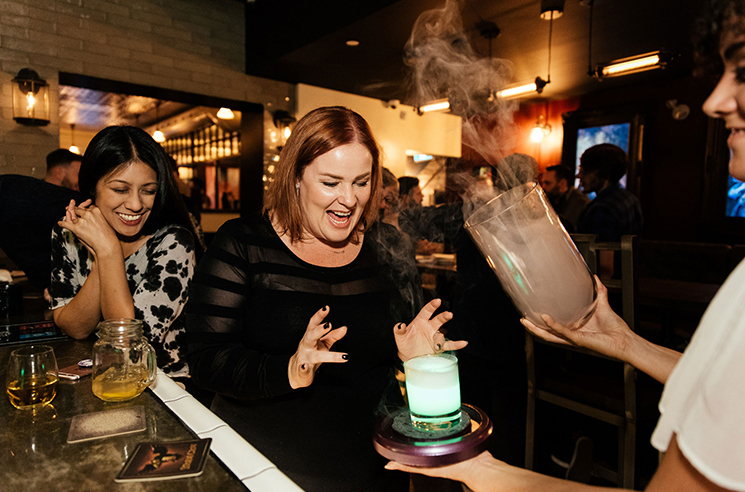 Nerdy pub chain Storm Crow Alliance has been offering pop culture-themed beverages, board games, and other geeky ephemera in Vancouver since 2012, and got Toronto in on the action when they opened the Storm Crow Manor in 2018. Now, another staple of their Vancouver establishments is set to hit Toronto with the expansion of their "DM & Dine" program, where Storm Crow Manor patrons can book comedians, podcasters and storytellers to host role-playing games at the pub. The "DM & Dine" program lets groups of up to eight people hire a "Dungeon Master" to lead them through a four-hour campaign of a role-playing game of their choice, including Dungeons & Dragons, 7th Sea, Marvel SAGA and World of Darkness. Character sheets, dice and food are included. The inaugural Toronto DMs include comedians Seann Murray and Justin Ecock, author Daniel J. Bishop, game designer Nicole Winchester, and "expert DMs" Bradley Silcar, Benjamin Xafflorey and Joan Moriarty. Though the program is designed for groups, Storm Crow also offers monthly "One Shot Adventures" — where individuals and small groups can sign up for the program — along with workshops to improve one's DM skills. The program was initially launched in both Vancouver locations — Storm Crow Alehouse and Storm Crow Tavern — in 2018. Vancouver's DMs include podcasters and comedians Eric Fell, Carmin Carotenuto, Joanna Gaskell, The GM Tim and Stu Popp. Learn more about the DM & Dine program here, and check out everything the Storm Crow Alliance has to offer here.